Life continues to get more difficult for foreign-funded NGOs in India. On June 20th this year, the Indian government issued a notification laying down procedures for “public servants” to disclose their income and assets under the Lokpal and Lokayuktas Act of 2013, an anti-corruption law. This notification requires all board members, trustees, chairpersons, and other office bearers of NGOs that receive foreign donations to declare both their personal assets and the assets of their dependents to the government. NGOs fear that the law would strongly discourage people taking on such positions and has already resulted in board members resigning. This is just one instance of the government’s crackdown on NGOs, and unsurprisingly, these requirements do not apply to the private sector, where foreign investment continues to be actively encouraged. Social entrepreneurship—a possible way forward? It was in this repressive environment that I set up my organization, Schools of Equality, as a non-profit social enterprise. The aim of the organization is to shift social attitudes that perpetuate identity-based discrimination. We work in both public and private schools, running activity-based programs that aim to sensitize children to inequalities entrenched in society, such as gender bias, class and racial discrimination, and religious intolerance, through discussions, art and theater-based activities. Through dialogue amongst diverse populations, including individuals who have not previously confronted these issues, we have witnessed a deepened understanding of the stereotypes and challenges faced by different social groups and increase in the level of mutual respect and empathy within the classroom. We wanted to develop a revenue-generating model that reduced our dependence on funding sources that restrict how and when the money can be spent. Given the nature of our activities, we wanted to develop a revenue-generating model that reduced our dependence on funding sources that restrict how and when the money can be spent. Currently, the organization gets paid for the program by private schools and offers it free to public schools. Finding progressive private schools to partner with in the largely conservative landscape has been challenging, so although earned revenue is the most common funding source for most startups, we require other sources of funding—especially at the early stages. Since we wanted to access grants and donations, especially as donations to non-profits get tax benefits, we chose to set up as a non-profit social enterprise, rather than a for-profit one. However, receiving foreign funding in India requires an FCRA (Foreign Contribution Regulation Act) certificate, which has become increasingly difficult to obtain and renew under the current regime. As a result, we have formed alliances with older non-profits that have an FCRA when applying for grants—but even these non-profits have been facing challenges during the renewal process. A for-profit model would have opened the doors to access impact investors and incubators that foster early-stage start-ups by providing technical assistance to navigate operational, legal and fundraising challenges. But, the “high touch” nature of our work conflicts with the traditional notion of scalability, which many investors are looking for. In other words, although we are expanding our scale of operation, we want to do it at a pace that does not dilute the quality of the program and the quality of engagement with each student; finding the right people is challenging and the time spent on training is critical. We therefore find ourselves facing a breadth versus depth challenge, as several years of training and monitoring are required before schools can fully take over the program themselves. A group of young Indian students and their teacher. 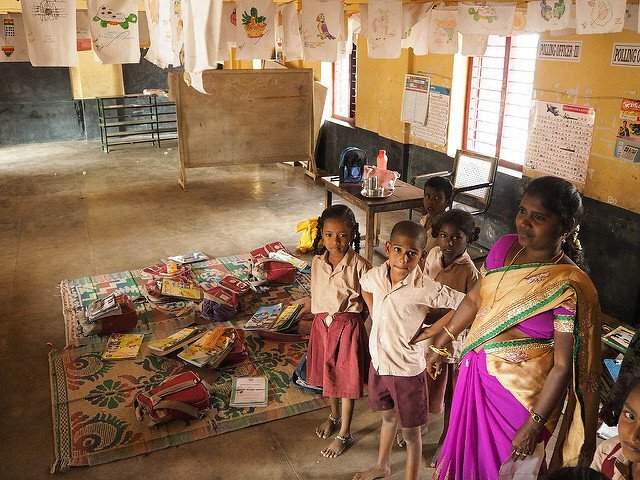 Given the infrastructure focus of Indian philanthropy, NGOs focusing on education quality are often forced to look elsewhere. In addition to partnering with private schools, our organization has sought support from Corporate Social Responsibility (CSR) budgets, and some companies and local philanthropists are supporting our work in public schools. However, while there is a positive trend in CSR-based philanthropy, it is still at a very nascent stage in India, with accessible funding being scarce. Further, while school education is popular amongst CSR initiatives, the primary focus is on support for infrastructure, with only 9% of CSR programs supporting more transformational changes like curriculum enhancement. That presents a significant challenge for non-profits that aim to affect learning outcomes or attitudinal shifts. After more discussion with private sector actors, we understood that CSR initiatives are generally designed to improve employee engagement. We started an “adopt a school” model, which allows companies to fund our work in a specific school, with employees in the relevant community invited to participate with our students—this has proved more successful that just asking for monetary donations. While the public-private partnership model is promising as a means for non-profit social enterprises to scale their work in public schools based on a fee-for-services approach, the government views this model with great suspicion as they believe such payments conflict with the understanding that education in India is meant to be not-for-profit. While this model has been used in for-profit sectors like infrastructure, it has unfortunately not translated successfully to education. Nonetheless, we have identified several champions within the government, and have partnered with the Education Department in the Corporation of Chennai, Tamil Nadu, and the District Education Officer in Kadapa district, Andhra Pradesh, both of whom have been very supportive of our work. As a result, we have been able to introduce our program within the mainstream curriculum of public schools in these regions. Given the turnover of bureaucrats, however, there is the risk of our programs stalling if a successor does not approve continuation, making continuous engagement critical. As NGOs, particularly those with human rights aims, tread a fine balance between meeting funders’ demands (whether foreign donors, private sector or government) and navigating closing space measures, it is important to stay focused on long-term theories of change, and a revenue-generating model is one way to do that. Of course, not all non-profits can generate revenue, and the time it takes to generate revenue varies according to demand (which does not often correlate with need). For these reasons, we need an ecosystem that will mitigate these constraints, encouraging organizations to address systemic problems that are not susceptible to quick revenue-generating solutions.